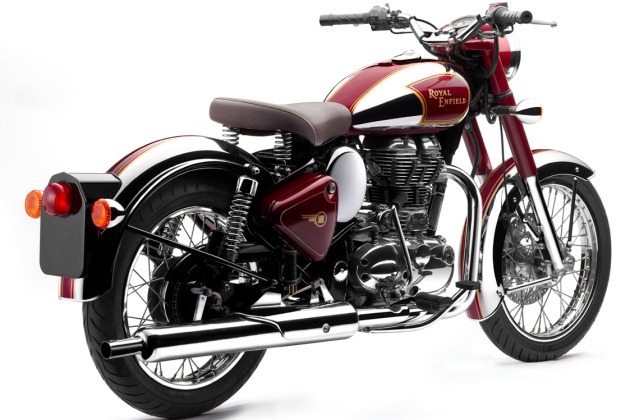 Royal Enfield shows off two new Classic Chrome and Bullet for U.S. The Royal Enfield camp is abuzz with interesting news. The British Indian motorcycle manufacturer has just whipped the sheets off of two new models that are destined for U.S. shores starting this April. The Classic Chrome is appropriately draped with enough shiny stuff to signal the space station on a clear day, and while we typically don't go all gooey-kneed at the sight of copious brightwork, this bike is officially on our do-want list. The Classic Chrome looks to share more than a few bloodlines with the popular C5, though the eagle-eyed among you will likely note a kick start lever. The U.S. C5 is currently only available with an electric starter, though we'd expect that omission to soon be rectified. Royal Enfield also showed off its new Bullet 500 - a bike that heralds to the Bullet 350 that's been a staple of the Indian moto scene for half a century. Company CEO Venki Padmanabhan said that the future's looking bright for larger displacement version of this bike soon. Royal Enfield just showed off a 600cc caf&eacute; racer concept at the India Auto Show, and there have been whispers that the manufacturer is also hard at work on a new parallel-twin engine displacing between 750 and 1000cc. That's right, parallel, not V-twin. Meteor, anyone? Of course, for us, we're equally as interested in the rumors surrounding a new adventure bike from the company powered by a multi-fuel adventure touring bike. Such an engine could swill down diesel, kerosene or gasoline as needed to get you where you're going. Sounds like a perfect vehicle for the impending Zombie apocalypse, no? Thanks for the pics, Wes! [sources: Indian Cars Bikes, Royal Enfields, Visor Down]Royal Enfield shows off two new Classic Chrome and Bullet for U.S. originally appeared on Autoblog on Tue, 25 Jan 2011 19:00:00 EST. Please see our terms for use of feeds.